On first impressions, it’s a nostalgic wonderland. The team have successfully created a world that harkens back to Banjo-Kazooie in almost every way, whilst still feeling unique and interesting to explore. The hub world and the individual worlds all have hallmarks of the team’s history, and even the pause menu is a shot of nostalgic emotion for me. The vibe, the atmosphere, it’s all here. At first. 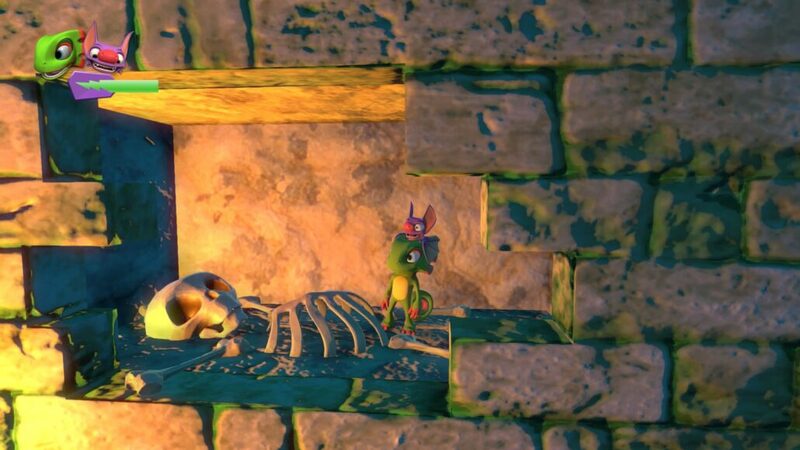 It’s a strange point to moan about, but Yooka-Laylee’s areas are so large they kinda feel lifeless. The challenges almost feel spread across masses of wasteland, whereas every inch and corner of a Banjo-Kazooie level had something hidden away for the player to find. Instead, the levels are large and empty, with characters that don’t necessarily suit their environments, and challenges that are so much more obtuse than they used to be. Not to say that it’s hard, necessarily, but climbing a tower just to find that there’s nothing to do there until the level is expanded is, well, nonsense. Yooka and Laylee’s moveset is another frustrating point and one that feels even more outdated than in the 90s N64 game it apes. 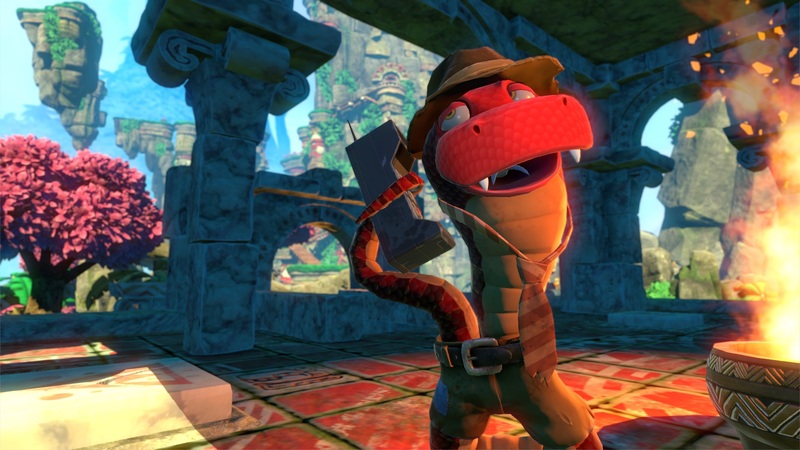 Whereas previously in Banjo-Kazooie moves were taught to you essentially as you approached a section that requires them – or are hidden in a stage, waiting to be found – Yooka-Laylee decides to give them all to a snake and forces the player to purchase them with Quills found in the stages. Oh, there’s plenty of Quills, 200 in each stage, but the game here is essentially forcing you to explore stages, knowing you don’t have the moves required to complete challenges, just assuming you’ll be okay with backtracking to the snake and back all the time. And as mentioned, these stages are large – unnecessarily so, and the backtracking only highlights that point. Then in other stages, all the nostalgia comes back. Bosses grunt away and insult whichever profession they assume I have, and simple challenges keep things interesting. But sadly, Yooka and Laylee move so badly. I never feel fully in control of the pair, when I flick the stick forward to look forward, Yooka doesn’t snap to whichever position on the stick I flicked, like a character in a responsive platformer would, and instead slowly spins on an axis. Ridiculous, especially considering whichever direction you look in can decide where you aim projectiles unless you use the ill-explained and poor first-person aiming. And then again, after some frustrations, I’m taken away by it all over. 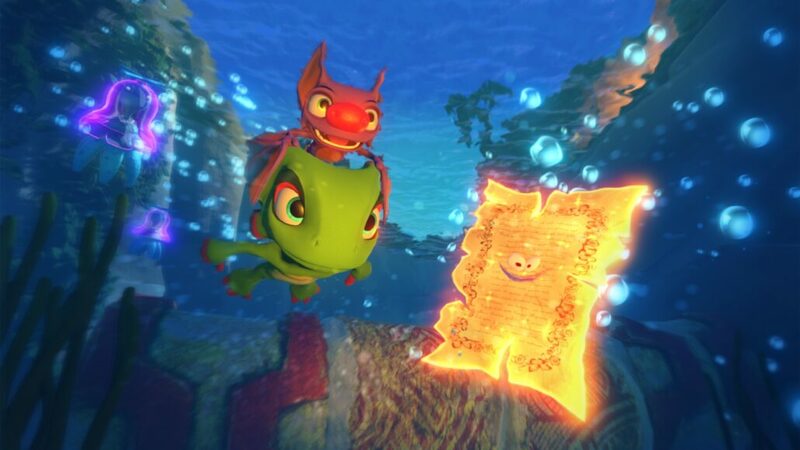 Yooka-Laylee is an astonishingly charming game, and I want to love it so badly, but floaty controls, dodgy physics and purely uninspired level design means it can be a real struggle to reconcile with, even though there’s a part of me really enjoying the experience. But enjoyment is certainly easier on the Switch. The game runs great, whether in portable mode or on the TV. A fairly smooth 30FPS, with only a few hitches and stutters to mention from my time with the game. Playing Yooka-Laylee while docked is one thing, but being able to sit down with it wherever you are makes it a much easier game to play. Playing infrequent, small bursts helps gloss over some of the minor control problems found in the game and it becomes a much more enjoyable experience. But alas, it’s a struggle to reconcile with Yooka-Laylee’s disappointing gameplay. I set myself up for disappoint after the first wave of reviews, but finally having it in my hands makes things worse. I didn’t expect much, then when jumping in the wave of nostalgia hit and I suddenly felt hopeful – only for those hopes to be trashed almost immediately after, when forced to run through a boring first level with no moves to use – and then came the discovery that, even when you do have the moves necessary to complete challenges, it’s still not very fun to play. Fun to explore, definitely, but fun to actually play? Not so much. Yooka-Laylee is a fun throwback to a simpler time, but in the process some things got lost in translation. 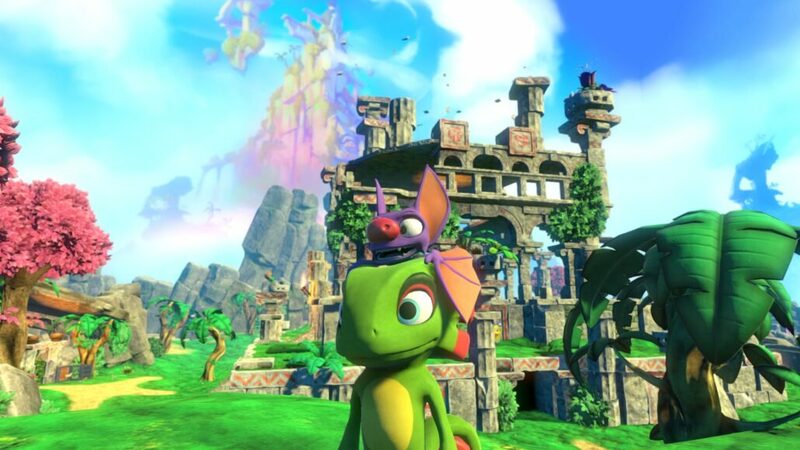 Whether it’s rose-tinted specs or just modern game design sensibilities, something doesn’t feel right with Yooka-Laylee, even if it runs great on Switch. I guess it just can’t compare to the likes of Super Mario Odyssey.